The Metro has been moving people through KC for nearly 100 years. 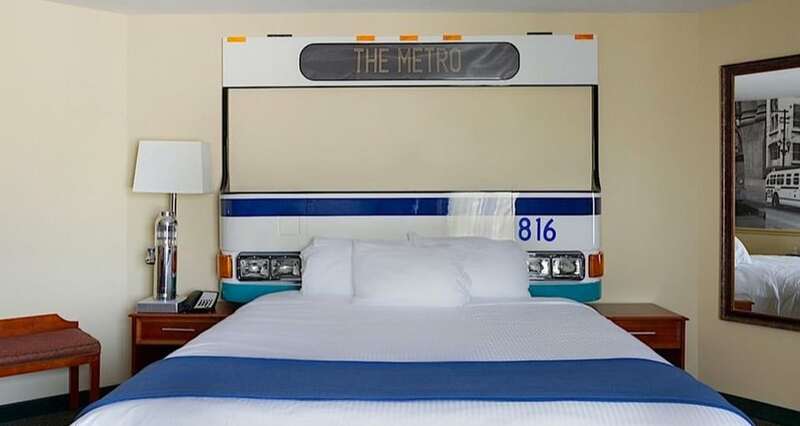 This room features a headboard constructed from a modern Gillig low-floor bus and lamps made from fare boxes. A mural in The Metro Room show early buses from the 1920 and 1950s. Artwork includes photographs of Kansas City Streetcars; In the 1920s, the Kansas City streetcar system was one of the largest in the nation. This is one of the most unique hotel rooms will find anywhere.